This is something I blogged a couple years ago that’s been on my mind this weekend. Memorial Day is a time each year when Americans remember those who have died while serving their country in the military. 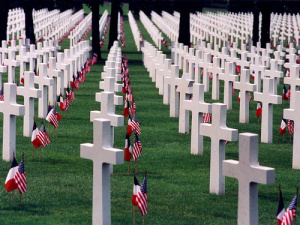 It is a time of reflecting on the ultimate sacrifice some have made to ensure the prosperity and safety of others. Since Memorial Day is observed on the last Monday of May, it results in a three-day weekend. Traditionally, this holiday also marks the beginning of the summer vacation season. Many Americans celebrate with traveling, recreation, and barbecues. In one sense, this flourishing of leisure activities seems strangely juxtaposed with the selflessness of those being remembered. Yet the liberty we enjoy and engage in over Memorial Day weekend is precisely what our soldiers have died to defend.